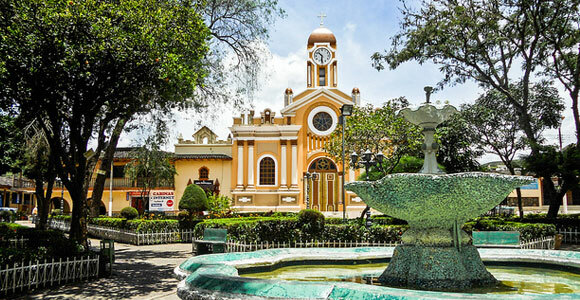 Tucked away deep in southern Ecuador is Vilcabamba, which lies at the heart of Ecuador’s southernmost province of Loja. The Incas referred to it as the “Sacred Valley,” but today it’s known as the “Valley of Longevity.” Vilcabamba village itself is small—only about 4,000 Inhabitants—but the international community is surprisingly diverse, with an ever-increasing population of U.S. and British settlers, as well as French, Germans, Canadians, and a sprinkling of other nationalities. The mellow lifestyle, small-village atmosphere, and wide-open spaces were exactly what they were looking for. It wasn’t that long ago that little Vilcabamba was virtually cut off from the rest of the world. Shipments of unhealthy processed food didn’t make it this far. There were no cars, and television signals didn’t reach this remote area. There was no pollution and both water and air were about as fresh as could be. Much of that has changed now, of course—you can get satellite TV and high-speed internet. There are cars and trucks on the streets. But Vilcabamba is still a very healthy place to live. The nearby mountains are virtually uninhabited and the streams that flow down from these mountaintops bring clear, fresh water. Vilcabamba is clean, small, and friendly. 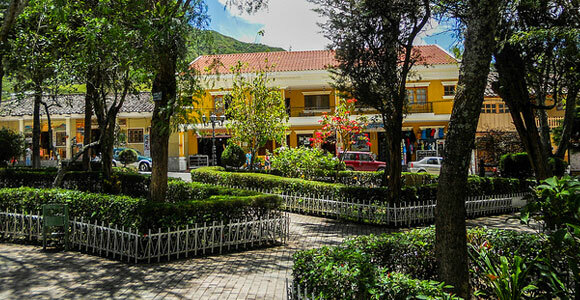 Its dreamy, well-maintained town square is one of our favorites in Ecuador. With their jagged peaks rising on all sides, the surrounding mountains are breathtaking. Crystal-clear streams splash down from the nearby cloud forest, providing the area with clean water. Its climate is one of the best in Ecuador. 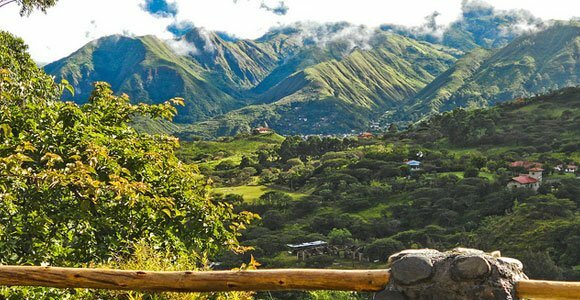 At a perfect altitude of about 5,000 feet, Vilcabamba enjoys glorious weather all year with temperatures in the 70s and 80s and moderate rainfall. Known as “The Valley of Longevity”, the natives of Vilcabamba have a reputation for commonly living into their 100s. Most who have studied the region agree that the combination of healthy diet, aerobic exercise, natural mineral waters, and contamination-free environment are the main factors for the residents’ healthy state. Our theory is that the local sugarcane liquor—distilled in most every cane field—is toxic to germs and viruses if you drink enough of it. Backpackers and adventure travelers have known about Vilcabamba for years, and it was only a matter of time before expats caught on as well—and now more people are coming to retire in Vilcabamba. As for population, the village itself has fewer than 1,000 people. Include those who live in the surrounding valleys and there are only about 4,200 souls in this hidden valley. But make no mistake, Vilcabamba isn’t a backward country village. That’s thanks to its popularity among world travelers. It has long been a staple on the international backpacker route and therefore you’ll find significantly more restaurants and shops than you’d normally find in a town this size. If you appreciate nature and the outdoors; if you like horseback riding, hiking, and communing with nature, then you’ll enjoy the lifestyle in Vilcabamba. High in the mountains of south-central Ecuador, it is often said to be one of the healthiest places in the world to live. In fact, the valley of Vilcabamba is often referred to as the “Valley of Longevity.” That’s because people here routinely live into their 90s and 100s. This healthy lifestyle is why you’ll find many folks here, both expat and Ecuadorian, who are seeking a more wholesome life. And while most are looking for that back-to-basics lifestyle it can be manifest in a variety of ways. In Vilcabamba you’ll find folks who enjoy getting down in the dirt and giving their green thumbs a bit of exercise. They grow much of their own food, raise chickens and/or other livestock, and provide for many of their own needs. There are others who prefer to live in a gated community where their yard is filled with decorative plants cared for by a hired gardener. They procure their fresh produce from the local markets where they spend a mere fraction of what they would in a North American grocery store. Many folks find that spending more time outdoors and access to good fresh food improves their health and increases their energy. You won’t need to worry about being bored in Vilcabamba either. The town square is surrounded by cute little shops and eclectic restaurants. Often you’ll find other residents here or on the plaza park benches ready and willing for a bit of socializing. Live music, dancing, tennis, and even a dinner-theater are all things you can regularly participate in in this south Andean town. And there is no end to outdoor activities here with hiking, biking, and horseback riding trails crisscrossing the valley. Of course you’ll have many of the modern conveniences of back home. Cable television and cell phones are widespread. High-speed internet means many people who are not yet retired can work from home. It also allows for streaming TV shows and live sporting events from North America, and keeping in regular touch with friends and loved ones back home. Other expats in the area tend to be well-traveled, varied, and free-thinking. You’ll find massage therapists, reiki experts, and other alternative health practitioners here. There are scientists, successful businessmen, and organic farmers, all enjoying life in this little valley. Conversations with other expats tend to be diverse and far from boring—just be sure to keep an open mind. Finding a place to live in Vilcabamba will be one of your first priorities when relocating there. While many people choose to rent at first some will be interested in having a place they can eventually call their own. With the increased popularity of this little town in Ecuador’s “Sacred Valley” real estate prices have increased in recent years, but are still lower than what you would pay in a similar North American environment. To sweeten the deal you’ll find that property taxes rarely come in above $100 per year and are often far cheaper. An added bonus of looking at real estate in Vilcabamba is that you’ll have a wide variety of choices. You may not find a condo in a high-rise, but most other options are available. A two-bedroom, 2.5 bath, 2,673 square foot home with incredible mountain views, completely furnished including appliances, cable TV and Internet. Price: $230,000. A fully-furnished, two-bedroom, one-bath house within walking distance of town on .22 acres of land (includes appliances). Price: $110,000. A small, two-year-old house on a 1.5 acre lot, seven miles from Vilcabamba, offers fabulous views in all directions. The land overlooks the Malacatos Valley and Mandango mountain and has more than 60 planted trees including macadamia, walnut, lemon, orange, grapefruit and palms. The house has a bedroom, a kitchen-living room, and a bathroom. There is a small storage shed nearby. Price: $80,000. Expats who live here report that their cost of living in Vilcabamba is low. Consider the spring-like weather all year, the large variety of fresh-grown fruits and vegetables available, and the stunning mountain scenery, and it’s no surprise that Vilcabamba has been appealing to expats for years. Those who live here can enjoy a fulfilling lifestyle at or below half the cost of many places in North America. The temperate climate cuts down on utility costs as there is no need for heating or air conditioning in houses. The fact that many foods can be grown nearby and all year round means great savings in grocery bills. And life in a small town makes getting around by foot very easy. When longer trips are necessary public transportation is readily available and inexpensive so most expats don’t bother owning vehicles—another huge saving for the pocketbook! Average costs for electric usage costs between $10 to $20 per month. Propane used for cooking and hot water typically runs between $5 and $7.50 depending upon the household. The cost of groceries can vary wildly depending on a couple’s diet and preferences. But in general you can count on saving a good amount of money on food and basic needs in Vilcabamba. Fruits and vegetables are often half the cost of what a grocery store in the U.S. would charge. Eggs from free-range chickens will cost under $2 per dozen. And a dozen freshly baked dinner rolls can be had for $1.20. 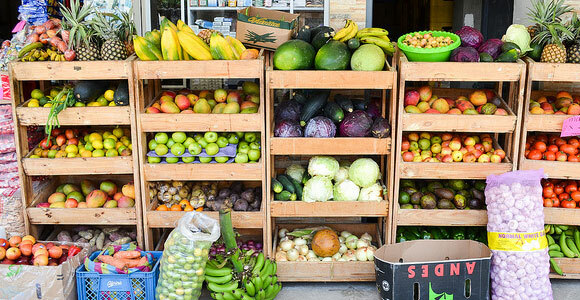 After a few months of living in Vilcabamba you’ll find the stores with the best deals, and which market vendors will throw a few extra goodies in your basket for free. Your new expat friends will also be full of great information on money saving tips and tricks in this part of the world. Meat products tend to cost about the same as what you would pay in North America. And any imported goods like wines, special sauces, and name brand cereals will all cost a bit more. If you don’t mind adapting to what is available locally you can save considerably on your grocery expenses. Below are two samples of monthly budgets for life in Vilcabamba. One showcases how a couple could live nicely on a relatively small fixed income while the other explores a more luxurious lifestyle.